This month’s edition of Sport Psychology focuses on how to coach a team that has made it to the Performance Stage. This is the stage in which the team has come together around a set of goals and norms, allowing them to play as one unit rather than a group of individuals. Looking back at the last article describing the Performing stage of team development, a few themes emerge. Results are a main emphasis as well as the right amount of focus on efficiencies in technique and tactics. Coaches do not need to put as much energy into helping the athletes find motivation. They are self (intrinsically) motivated in this stage. The athletes are a tight cohesive unit performing consistently at their best. When unforeseen challenges present themselves, the leaders on the team take control by directing and supporting others as needed. A basketball coach has been working all season with his team to find the right rhythm and pace of play to allow the individual strengths of each player to complement each other. The team is competing in the final two games of their conference before heading into playoffs. Throughout the season the coach has implemented a buddy system between veteran and rookie members of the team to create social unity off and on the court. The team also has a motto they recite in unison as they step on the court to remind them of their purpose for the season and the importance of today’s practice or game. All the athletes shared a role in creating it. In the last two games, this coach is finding it challenging to step out of the role of team builder and controller even though the athletes are making plays and hitting shots consistently. The coach wants to tell the athletes where they should move and what they should do even after time-outs where each player on the court understood the play drawn up and their role. It is becoming frustrating for the athletes and they feel a little held back from the pace and flow that they would like to play. It is clear that the coach has put in a lot of great work throughout the season. The athletes seem to be coming together at the right time of year and performing as a unit. At this point, the coach needs to allow the athletes to make their own decisions on the court. If standing during games adds to his over involvement and need to dictate to the athletes then perhaps the coach should sit. The key is for the coach to find a way during games to become aware enough to know what he needs to do to become more of an observer rather than a director. During stoppages of play, the coach should engage with the athletes to broaden their awareness of what’s happening on the court. The coach should also allow the athletes to share their own perspective in certain situations where risks were taken or mistakes were made. Perhaps the play would work if executed better. The main point is to allow the athletes to take over control as long as team play is emphasized and demonstrated by the athletes in the game and on the sidelines. Play calling will still be led by the coaching staff but the athletes will have the autonomy to make adjustments when executing as needed. A college softball team has won their conference and now prepares for the college softball world series. Nerves and excitement are high with the athletes and coaching staff. During conference championships, the athletes played their best softball of the season. Now, the coaches are preparing for their first opponent in the world series. While at practice, the coaches increase the intensity of their instructions by yelling louder and critiquing every mistake. The athletes’ body language seems tenser and their mistakes start to increase in the form of throwing errors and poor technique at the plate. The coaches are looking to find a way to find the high level of play the team showed the week before at their conference tournament. First, it’s important to understand that teams will never play better than their best but they will play worse when the pressure is on and tension rises. Often, the perception of how important playoffs are to people creates negative impacts on athletes’ ability to perform. This team’s performance in conference was great enough to win and more importantly help the team play its best softball of the season. As they prepare for the first matchup of the playoffs, the focus of the coaching staff should be on support to maintain players’ confidence. One of the best ways to continue to be confident is to watch video of your best play. The team wants to continue to play at their best so it makes sense to show them what it looks like. Showing video to point out all the mistakes creates negative mental images. It’s the same as physical practice. You would want to repeatedly practice successful movements. The mind works the same way by wanting to repeat whatever is reinforced. In the team’s preparation for the playoffs, it is also a great time to practice breathing techniques to help athletes gain control of their nerves. Put them in control of their situation rather than the situation controlling them. The coaches could practice with the athletes to model the behavior and adapt it for their own benefit. Breathing for performance is a gateway skill that should be followed by an intentional focus on the task at hand. High performing teams enter a stage of development where they know what to do and have the confidence to do it. Tactical and technical improvements can be made but it’s best to make adjustments as simple as possible. When a team is performing, coaches can adjust their style to more of a macro perspective of observation and strategy. Put the right players in the right positions and allow them to own their performance. After a season ends and a team disbands, it is important to add an element of closure. The Adjourning stage was added to Tuckman’s model to address these needs. At this point, reflection and celebration of the athlete’s accomplishments should be shared with them. A formal end to the roles and duties of that team should be communicated. Want to learn more? Follow the articles below for the whole story! 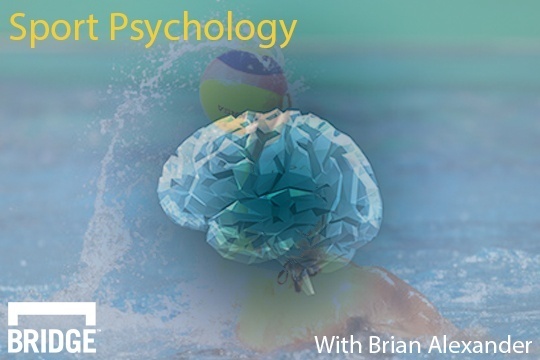 About the author: Brian Alexander is a mental skills coach who combines eight years of experience as an Olympic level water polo athlete, a master's degree in sport psychology, and business leadership training and coaching from The Ken Blanchard Companies to partner with athletes and performers of all ages and levels. "My passion is to empower others to succeed in life, athletics, performance, and daily activities. My personal mission statement is to be a genuine and honest leader who collaborates with and learns from others in order to find a mutual personal level of excellence physically, mentally, and spiritually."